I have something extremely fun to teach your kids today! Do your kids like ice cream? Do your kids like play dough? 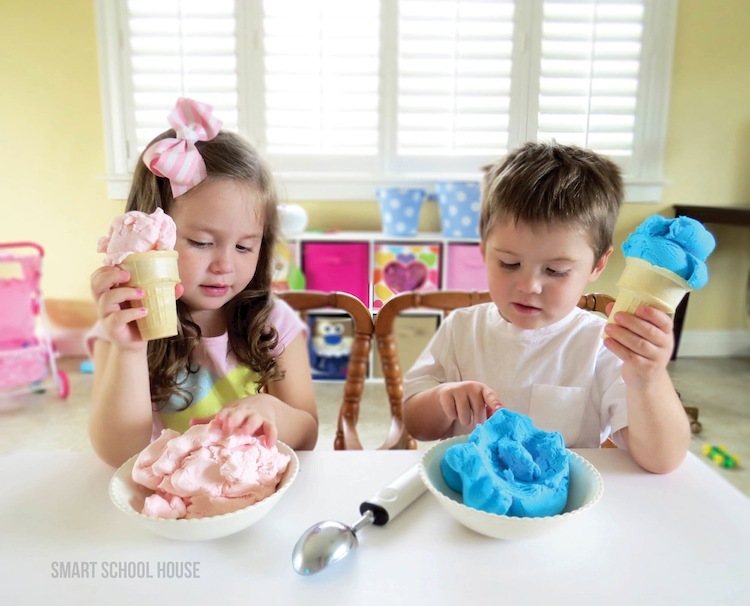 Ice Cream Play Dough combine those two wonderful things into a kid friendly craft. It’s edible, it’s soft, and it looks and moves EXACTLY like ice cream. Stella picked out a pink frosting and, of course, Mitch picked out blue. That boy LOVES blue I tell you! But, you can use whatever color frosting you or your kids want. You can even use chocolate frosting, which will make the play dough look EXACTLY like chocolate ICE CREAM! 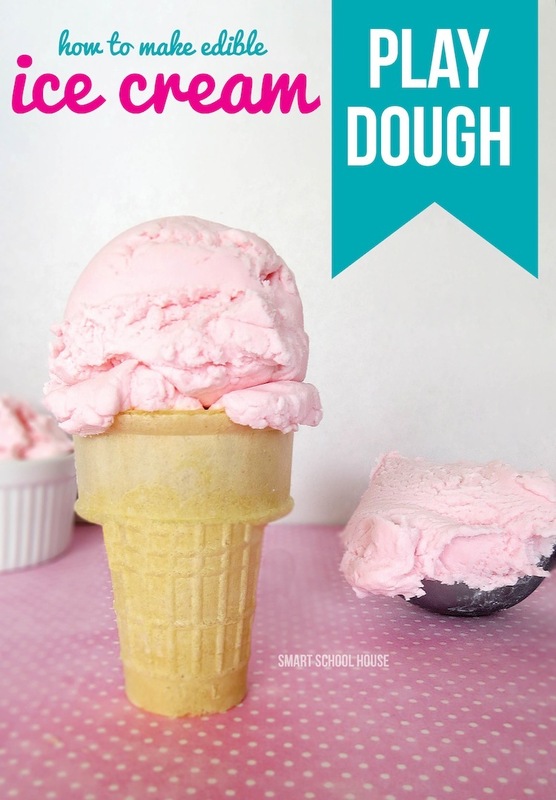 This recipe is unbelievable…..
Have you ever scooped ice cream yourself? Ice cream pulls apart and rolls into an ice cream scoop in a very particular manner. 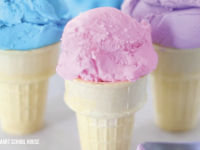 This ice cream play dough pulls, rolls, scoops, and sits exactly like real ice cream. Just check it out! You can scoop it with a REAL ice cream scoop and you can fool everybody around you into thinking it’s actual ice cream! 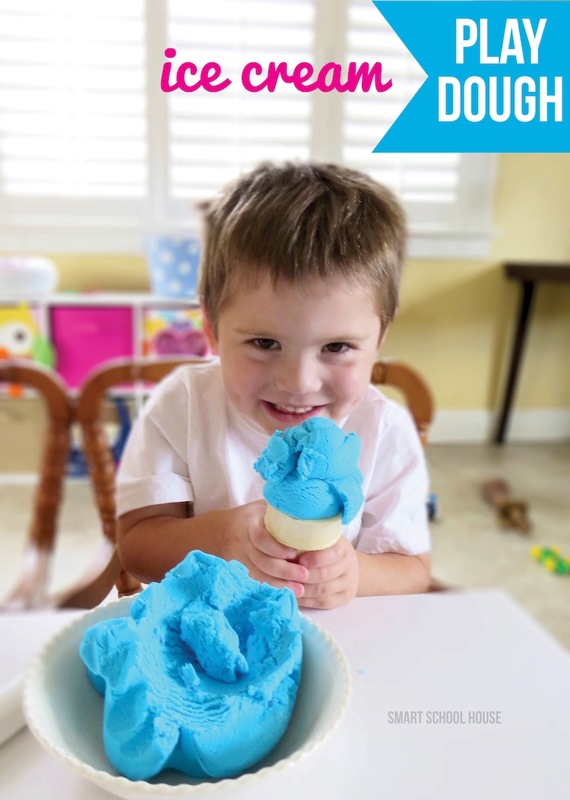 This is not something that can be done with any other play dough recipe… it’s truly one of a kind and you are going to laugh at how easy it is to make. I gave Stella and Mitch an ice cream scoop and some ice cream cones to play with their play dough. Do you think they were happy? Do you know how hard it is to get a 2 and 3 year old to sit and play for that long? It was lovely……..
Oh- and since the entire recipe consists of only frosting and powdered sugar, this play dough happens to be completely edible! A lil’ sugar never hurt anybody! Now, I made sure my kiddos didn’t sit there and actually eat the play dough (they could have been bouncing off the walls on a sugar high!). However, if they nibble a little bit, which kids will do because it is part of the learning process, then rest assured they will be perfectly fine…..and probably really happy! It tends to show slight signs of drying out after about an hour or so. No, it doesn’t completely dry out, but little flakes will separate around the table. Blame that on the powdered sugar. If it starts to dry out from so much playing, simply drizzle a little olive oil on top of it and the play dough will return right back to the normal consistency. But- be aware that, just like all play dough, this recipe will provide it’s fair share of clean up. Be sure to clean the play dough off the table when the kids are done playing. Otherwise, that powdered sugar tends to dry up and become hard to remove. A little soapy water will remove it like magic! Looking for more Edible Play Dough Recipes? Add the powdered sugar to the frosting in slow increments using the dough hook attachment on your mixer, continually scraping the sides of the bowl. Before you add all of the powdered sugar, touch the play dough and, if it feels at all sticky, add the rest of the powered sugar in (just continue to test the “stickyness” and say no to sticky play dough). Once you’ve added all of the powdered sugar, the play dough will begin to look just like ice cream in your mixer. Roll it into one big ball and make sure it is not crumbly or sticky. If, by chance, you added a little too much powdered sugar, don’t worry! Simply sprinkle a little olive oil onto the play dough and BOOM! Problem solved! Oh my goodness Kelly! How fun is this?! Can’t wait to play around with it! This is SO awesome! My 6-year-old wants a Frozen movie themed birthday and I think I’ll make a couple of batches for the girls to play with as one of our activities. Such a sweet idea and your photos are just beautiful. Thanks for sharing! no wonder they like it its pure sugar!!! ur children will have no teeth silly woman!!! LOL Denise! I’ll make them glittery dentures if that happens! Dee! You are not forced to make this. If you can’t say something nice, don’t say anything at all. Didn’t your mother teach you this? Kelly, This looks like so much fun. I love how it is so easy to make too. Your kids look adorable in these pictures. See you tomorrow in Parent Participation class. So cool, Kelly! Totally making this with my kids! Oh My How I really Love the way this looks! Unfortunately, I am NO Baker & don’t own a mixer–would it work by hand (if starting at room temp), & or Blender on the slowest? I’m not sure we ‘ll be able to do this one … But it’s lovely none the less! I to am wondering if there is a way to make this without a stand mixer. Have it on my list of activities for spring break next week, sure hope there is another way. Pingback: Escuela Infantil GRANVIA Vistahermosa » Archivo del weblog » Manualidades caseras: ¡masas para modelar y comer! This looks great! Quick question, you said premade frosting? Do you mean like the Betty Crocker cake frosting? I only ask cause it doesn’t look the same consistency as what’s in those little tubs. Thanks !